I married a carnivore. He didn’t. I’m perfectly content being vegetarian, but I can’t convert him. When I do cook meat, I want it to be free of antibiotic, hormone and GMO free. I was so excited when I came across a site called Butcher Box (this is not a sponsored post). Each meat portion was individually wrapped, which means I only have to thaw enough for my husband. Delivered to my door once a month! Grass fed beef that life on pasture. Antibiotic, hormone, and GMO free. I receive cuts of meat that I could never find in Utah, which makes it fun to cook something new. You can check out their site if you would like to read more about them. In my first box I received pork chops. Something that I haven’t cooked in years. My husband was so excited. I hope you enjoy this quick and simple recipe that I created for him. The pork is first brined. 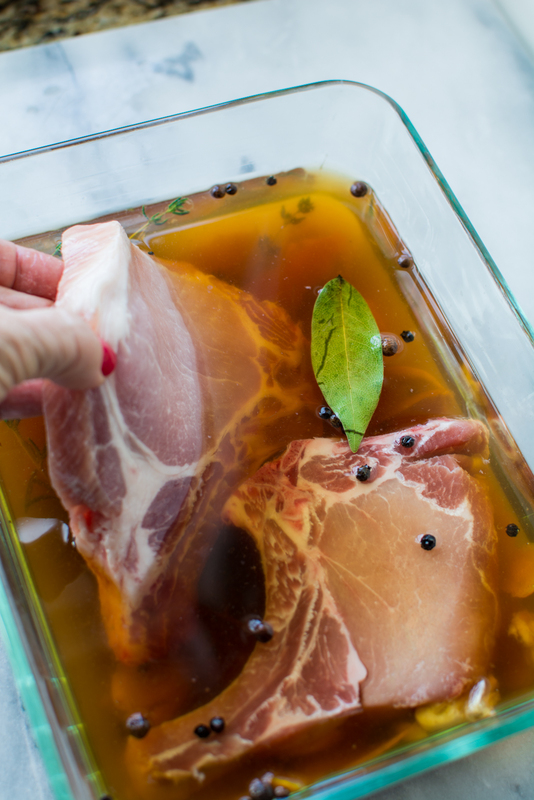 Soaking the pork in a brine not only adds flavor but makes it incredibly juicy. Brining is a wonderful way to get succulence out of any lean meat. This step can be skipped, but I highly recommend it. You will just need to think ahead. In small sauce pan add 2 cups water, salt, and coconut sugar. 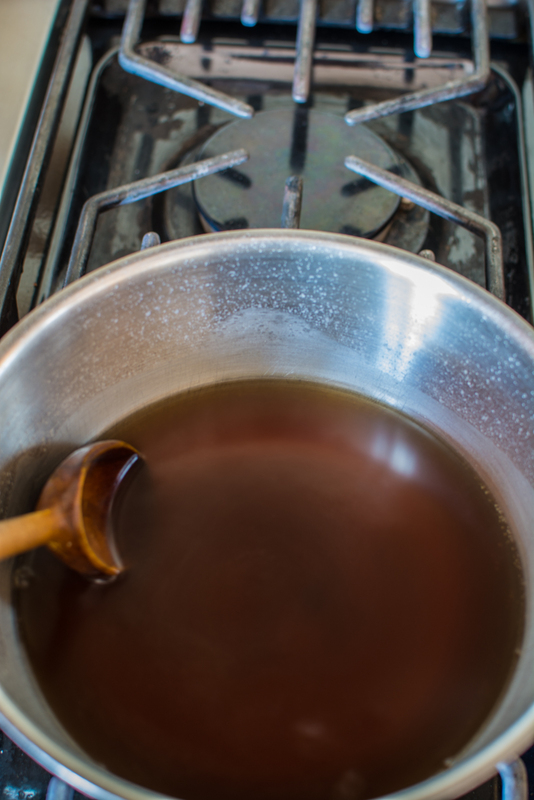 Bring to a simmer and stir until salt and sugar is dissolved. 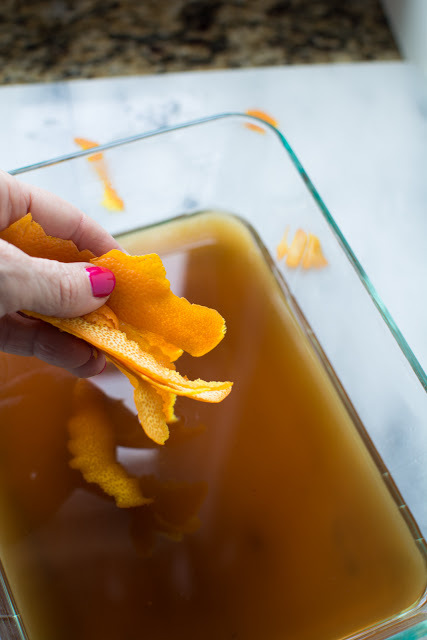 Pour the hot mixture into a dish or other brining container and add the remaining 2 cups cold water. 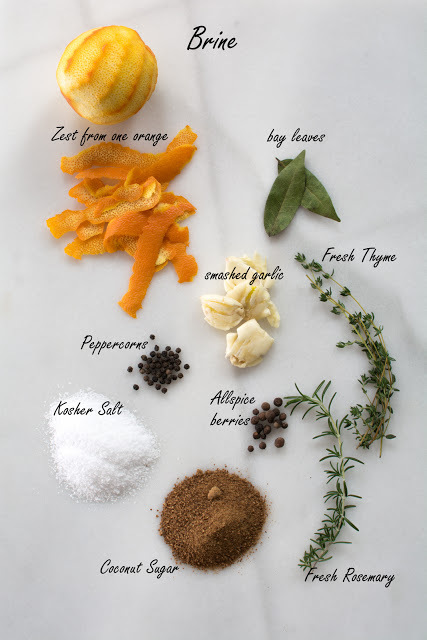 Add the orange zest and other brining herbs and spices. Add pork chops to the cooled brine. Cover and refrigerate. 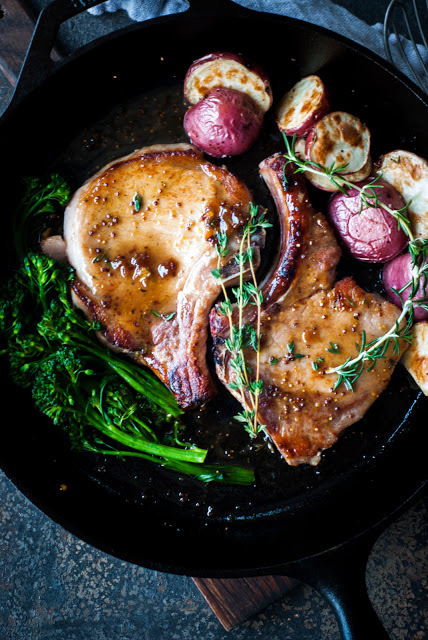 Allow the pork chops to brine for at least 4 hours. Because these pork chops are thin cut, I only brined for 4 hours. If they were a very thick cut, I would brine overnight. When ready to cook, remove pork from the brine. Dry the meat with a paper towel and allow to drain while you heat the pan. Place a large skillet the the oven and preheat to 400 degrees. 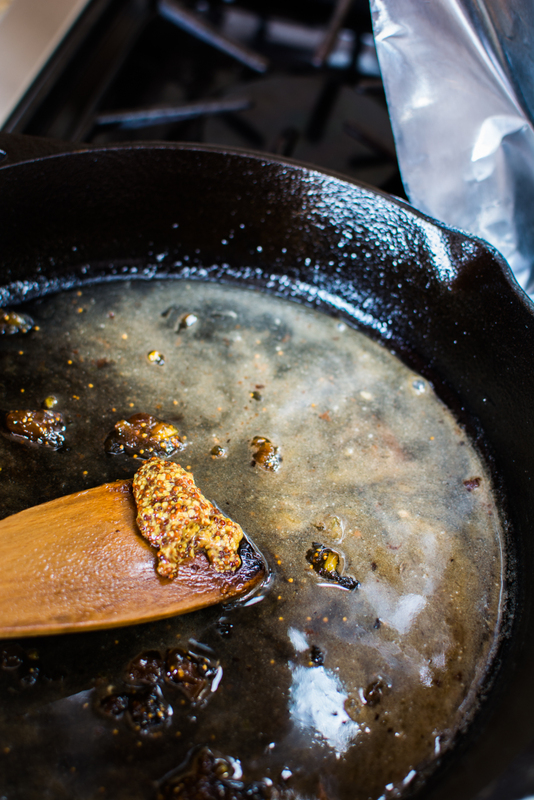 Once the skillet has preheated in the oven, carefully remove and place on a cook top over medium-high heat. Add about a tablespoon of olive oil or coconut oil. 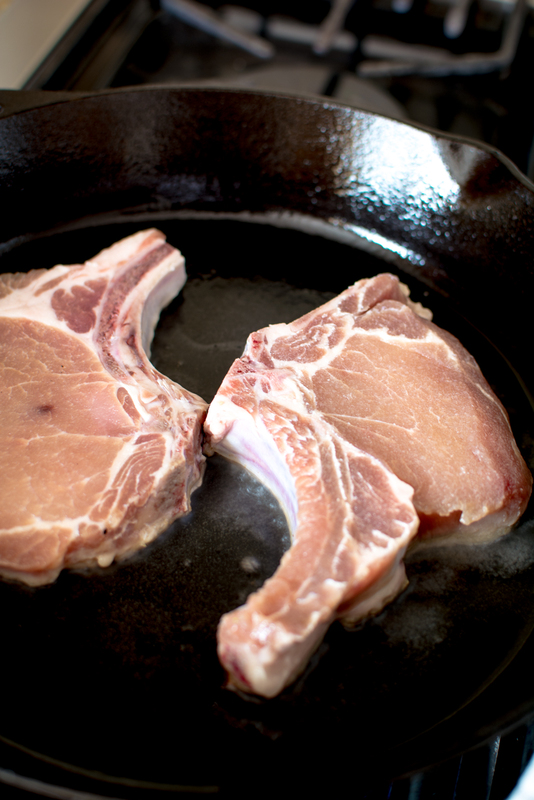 Add pork chops to the hot pan. Once they have browned, turn them over and brown the other side. 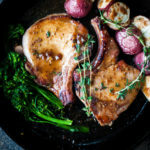 Return the skillet and pork chops back into the 400 degree oven and cook for about 6 minutes for thin cut about 12-15 minutes for a 2-inch thick chop. 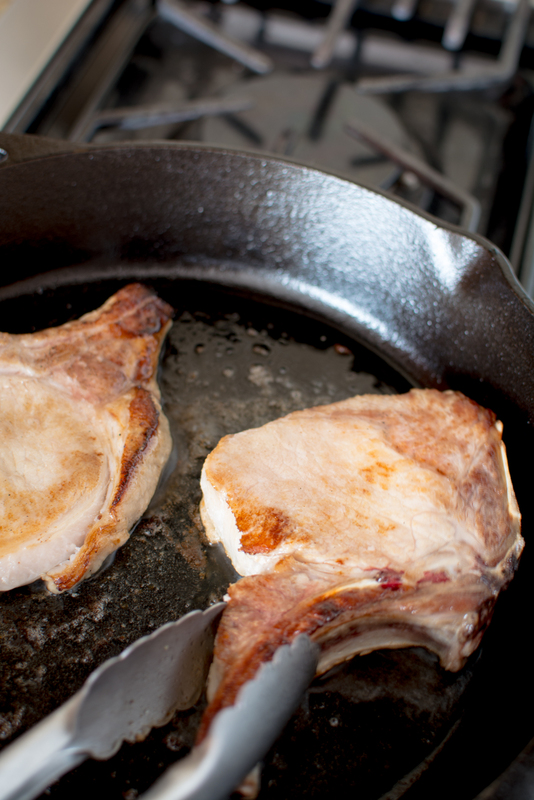 Remove skillet from oven and remove pork chops to a plate and tent with foil. Add 1/2 cup white wine to the pan. Bring to a simmer while scraping all those wonderful bits from the bottom of the pan. Reduce slightly then add 1/2 cup chicken stock. Reduce by half. 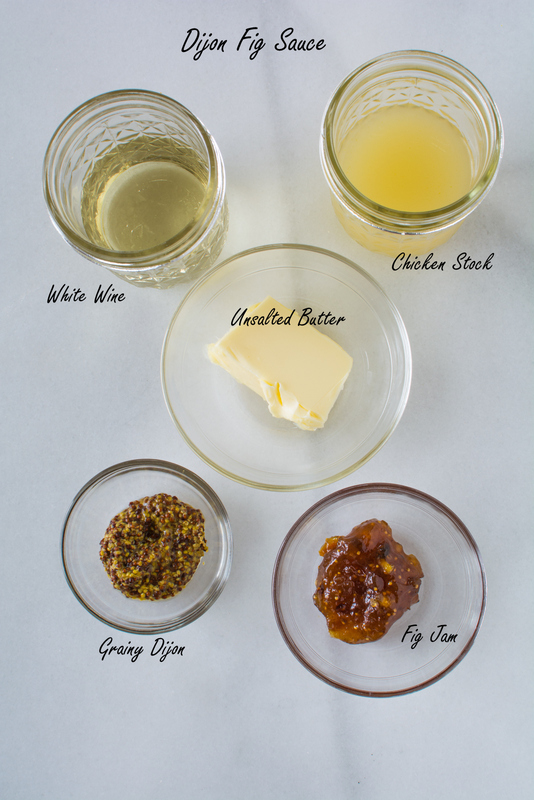 Stir in 1 tablespoon fig jam and 1/2 tablespoon grainy Dijon. Stir until the jam has melted. 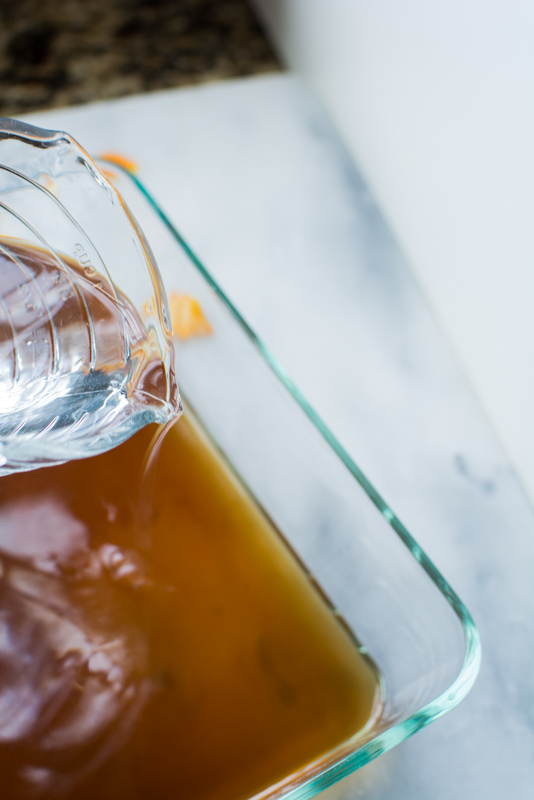 Add 1 teaspoon apple cider vinegar just to give it a little splash of flavor. Turn heat off and stir in butter, if you’d like a richer and slightly thicker glaze. This is optional, but delish. Pour glaze over pork chops and serve. This cooking process should take less than 15 minutes. This is a quick and easy meal. After the brining, of course. The Carnivore likes potatoes on the side. I like a big bunch of steamed broccolini. 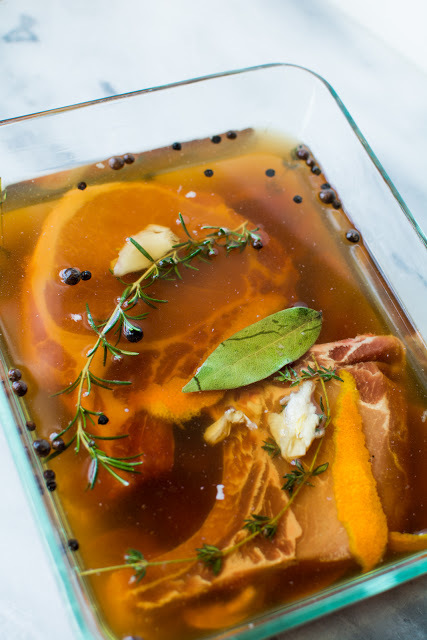 Brining keeps the pork moist, which is often tricky to do. The glaze really takes the meal up a level. In a small saucepan add 2 cups water, salt, and coconut sugar. Bring to a simmer and stir until salt and sugar is dissolved. 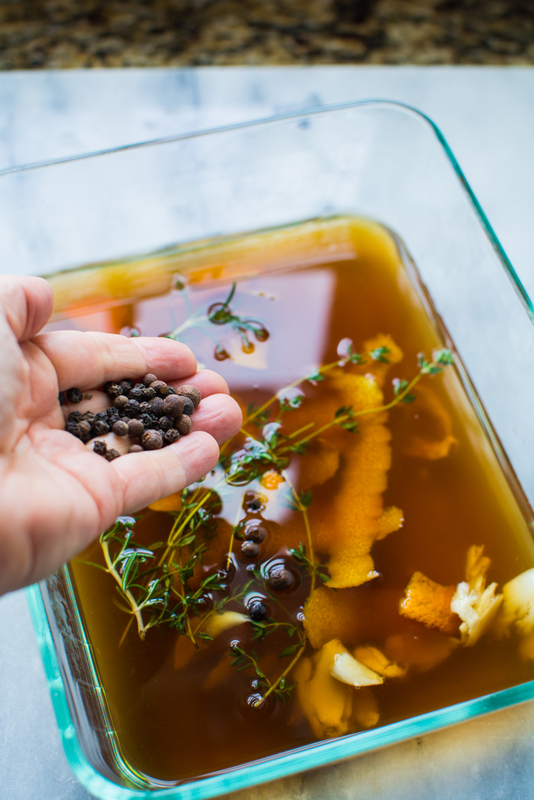 Pour the hot mixture into a dish or other brining container and add the remaining 2 cups cold water, orange zest, peppercorns, allspice berries, rosemary, and thyme. Cool completely. Add pork chops to the cooled brine. Place in refrigerator and allow chops to brine for at least 4 hours or more for thick cut. When ready to cook, remove pork from the brine. 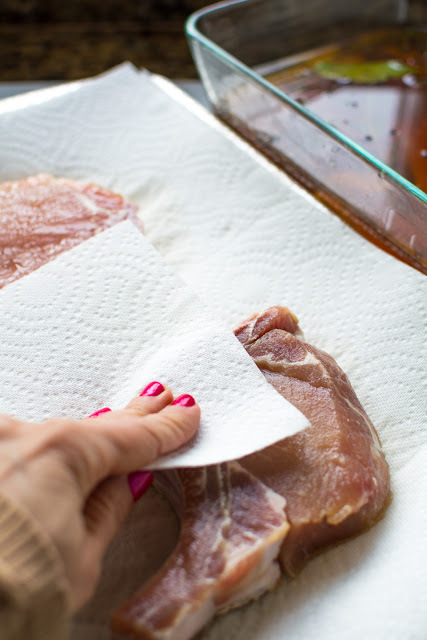 Dry the meat with a paper towel and allow to drain while you heat the pan. 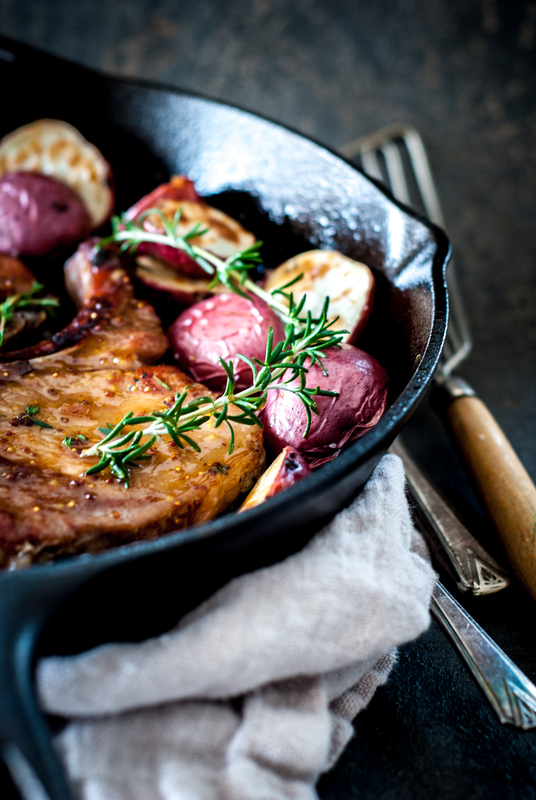 Place a large skillet in the oven and preheat to 400 degrees. 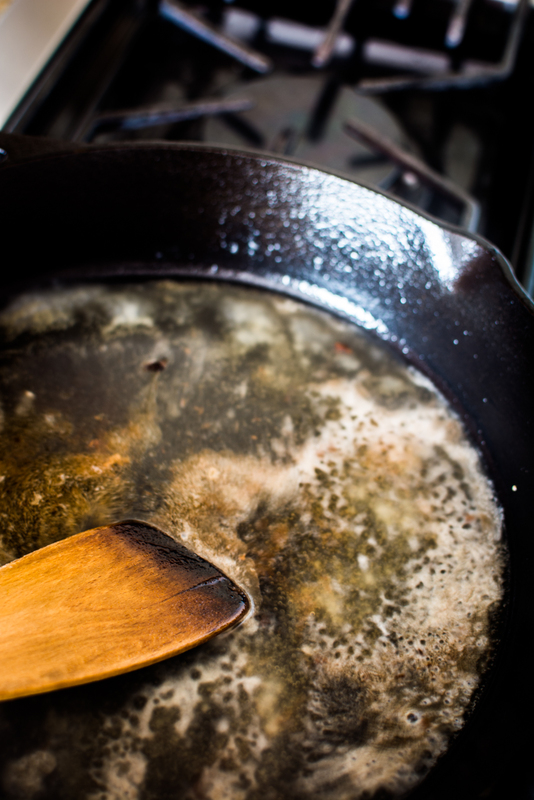 Once the skillet has preheated in the oven, carefully remove and place on a cooktop over medium-high heat. Add oil to hot skillet and brown chops on both sides. Don't fully cook, just brown them then return to 400 degree oven and bake for 6 minutes. 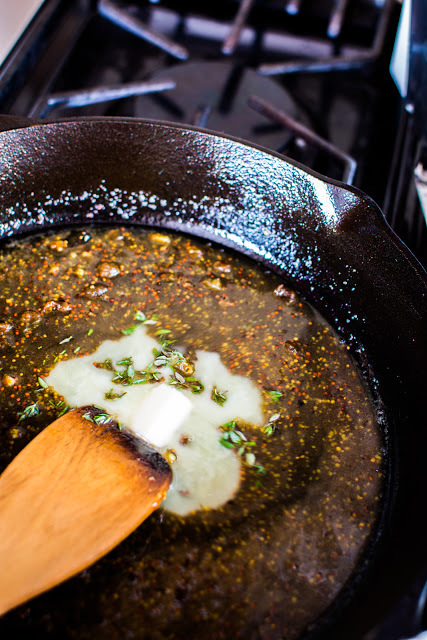 Return the skillet to a burner set on medium heat. Place pork chops and a plate and tent with foil. Add white wine to the hot skillet and deglaze the pan, scraping up any bits on the bottom. Add chicken stock and reduce by half. Stir in Dijon, fig jam and vinegar. Stir until jam has melted. Turn off heat and stir in butter, if desired. 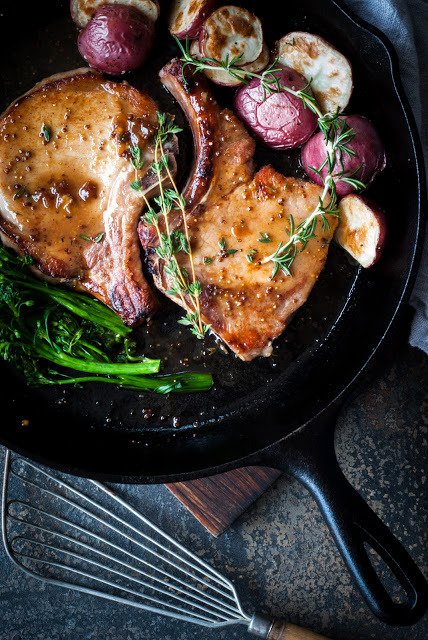 Pour glaze over pork chops. Mathew; I don't know where you live but Italian delis usually carry fig jam because it pairs with proscutio so well. I got mine at Caputos deli, in Utah. I have a confession to make. I'm a carnivore too as well as my Honey. Yep! I really like my meat and your chops look like they're worth 10 drools (my version of stars). 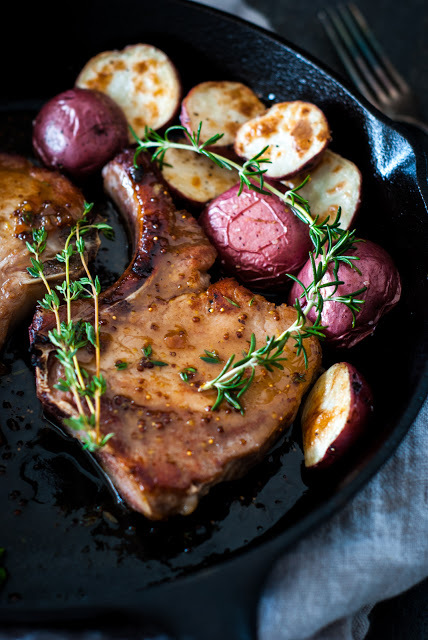 We're fortunate that we can find good meat sales — I'll have to try this fig glaze . LOVE figs. Thank you for the inspiration. Have a great weekend. Thank you, Marisa. I love your idea of "drools".